"A nice change from regular scrambled eggs. These eggs come out creamy and soft. Perfect with a slice of tomato and turkey bacon for a delicious and fast low-carb breakfast." Melt butter in a skillet over medium heat. Pour beaten eggs into the skillet; let cook undisturbed until the bottom of the eggs begin to firm, 1 to 2 minutes. 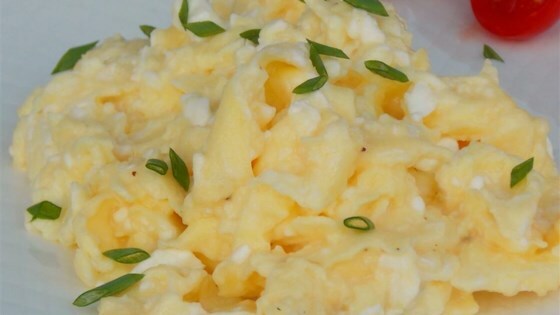 Stir cottage cheese and chives into eggs and season with black pepper. Cook and stir until eggs are nearly set, 3 to 4 minutes more. Fresh basil, cherry tomatoes, and feta cheese make the perfect summer scramble. Really good way to add some protein to your eggs, but I would recommend straining the cottage cheese before. It took a while to cook off all the liquid. Yummy, no need to add salt or shredded cheese (like I'd normally do to scrambled eggs). Extends the eggs and adds more healthy protein. "Recipe" is a keeper!